The well-established ‘Northern Circuit' safari of northern Tanzania offers some of the world’s most diverse safari experiences, consisting of National Parks, game reserves, conservation areas and private concessions. Among these are the world-famous and iconic Serengeti National Park and Ngorongoro Crater, and of course their less well-known neighbours, Tarangire National Park and Lake Manyara National Park. These parks exist for one general purpose and that is to protect the amazing variety and abundance of wildlife in them, both resident and seasonal - and most of all, the world’s largest annual migration of wildebeest and zebra. Although this part of the world has become increasingly busy as a result of its reputation, it is still possible to escape the crowds and find a quiet corner if you know where to go. A northern Tanzania safari should be on everyone's travel bucket list. The Serengeti National Park's Great Migration is one of the most amazing wildlife spectacles in the world, whilst safari on the Ngorongoro Crater floor of the extinct volcano at Ngorongoro is a game viewing environment that has no equal. Towering above it all is Kilimanjaro, the worlds highest freestanding mountain and arguably Africa's toughest challenge. Away from the tourist hotspots, quieter parks such as Tarangire National Park offers superb for game viewing yet often overlooked to their more famous neighbours. The Rift Valley Lakes of Eyasi and Natron are the home of Hadzabe tribes and the breeding grounds for the largest flocks of flamingo on earth. For many people, a Northern Tanzanian safari is the very best safari of all. Tanzania’s northern safari circuit is the most celebrated safari area in Africa. Home to the world-famous Serengeti National Park and Ngorongoro Crater, and the lesser known parks of Lake Manyara and Tarangire, the sheer concentration of Africa’s big game in this area is phenomenal. Most itineraries to this region are designed around the Serengeti National Park and the Ngorongoro Crater, with the Serengeti’s Wildebeest Migration and immense predator concentrations as the main attraction, not to mention the Ngorongoro’s big five experience. The area is also home to a variety of different cultures including the Maasai and the Hadzabe, as well as being one of the most scenically striking and diverse parts of the continent. Northern Tanzania Safari or Southern Tanzania Safari? The parks in southern Tanzania are more remote, however easier to get to with daily flights from Dar and no stopovers required. The camps in the south are better value for money than those in the north, tend to be more intimate, and offer various activities including walking, boating and fly camping. Game viewing is in open-sided vehicles, which enhances the viewing experience. The south favours the shorter safari and beach combination and therefore offers a quick, cheap and very rewarding experience with hardly any other visitors. By contrast, in the north the majority of parks require closed sided vehicles, do not allow walking (except in select camps) or boating safaris, and in most cases the areas are very crowded and not so ‘wild’. Most of the camp and lodge options are large and characterless, but if your budget permits and you know what you are doing, you can find the small tented camps which are tucked away from the busy areas. However, the rewards in the north are the big five, the Great Wildebeest Migration and the spectacular scenery - but do watch out for higher prices generally and poorer value for money at the low- to mid-range. For the high-end traveller there is the &Beyond flying circuit which involves absolutely no driving between camps. A typical such safari includes two nights at the Lake Manyara Tree Lodge, two nights at the Ngorongoro Crater Lodge and anything upwards from two nights at Serengeti Under Canvas and/or Kleins Camp. This is a fabulous, high-end trip. The icing on the cake would be to add on one ore more of Singita’s camps in Grumeti Reserves: Faru Faru, Sasakwa or Sabora. 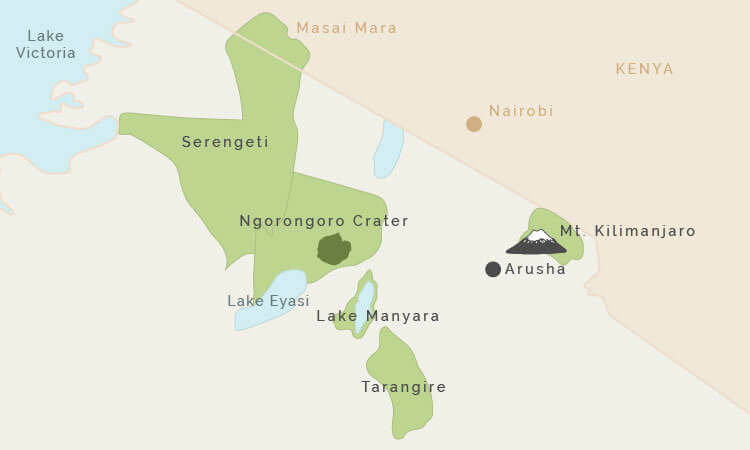 A mid-range northern circuit (by far the most popular that we sell) would involve driving between Arusha, Lake Manyara, Tarangire and the Ngorongoro Crater and Highlands. Then you would fly in to one of the smaller tented camps in a remote and quiet part of the Serengeti, where there are far fewer people. This kind of safari is more economical than the high-end trips without necessarily impacting on your game viewing experience - you save money by driving (rather than flying) the first part of the circuit, but you then fly to wherever the migration is taking place in the Serengeti. The most economical safari is a full driving circuit done the old-fashioned way, with your own private driver-guide who will accompany you for the whole trip. This is especially cost-effective the more there are of you to share the cost. We only book private safaris, and plan the park combinations according to season. The benefit of having your own vehicle is that you can stay in the less-expensive hotels that do not provide their own safari vehicles, and your private driver-guide will be ready to show you the best of the region each day. However, the downside of this type of circuit is that you are limited to staying in the larger lodges in the busy areas of the parks - this is a bit of a letdown for the Serengeti since you cannot always guarantee seeing the migration. The northern parks are renowned for offering very limited activities, and in most cases you are constrained to daytime game drives. However this does vary a bit from park to park, and the private concessions sometimes have a little leeway and can offer night drives and walking. The Ngorongoro Crater offers only daytime game drives, and if you are staying at one of the lodges on the crater rim itself, you can sometimes do a short bush walk around the property. The lodges in the wider Ngorongoro Highlands area offer more activities including hiking, riding and mountain biking. The Serengeti National Park also offers daytime game drives only, unless you are staying in the far northern Kogatende region where some camps such as Alex Walker's Serian and Serengeti Lamai offer walking safaris in limited areas. Kleins Camp and the Singita properties on the Grumeti reserve offer night drives and walking since they are private. Lake Manyara National Park is so small and very accessible that it allows day game drives and even night game drives depending on where you are staying. Tarangire National Park is the most diverse park for activities. Inside the park, Olivers Camp and Swala offer walking safaris and night drives, as well bush nights where you camp out under the stars. These are also available at the camps outside the park, albeit in a less inviting location. The surrounding areas like Empakai, Lake Eyasi, Mt Meru and Kilimanjaro offer the obvious walking and trekking, with Eyasi and the Southern reaches giving the opportunity to hunt with the Hadazbe. How much is a Northern Tanzania Safari? The northern camps vary enormously in price, and as a general rule, the higher the price, the better your camp and game experience. At the lower end of the spectrum are the large permanent lodges like the Serena and the Sopa which have anything from 70 rooms and cost about $500 pppn including game activities, and this is pretty standard for all the parks. There are smaller tented camps such as Kati Kati in the Serengeti which break into this price bracket but are in equally busy areas. The mid-range choices include some excellent mobile tented camps such as Olakira, Dunia and Ubuntu, at about $650 pppn. The enormous advantage of these camps is that most of them move every four months with the migration thus avoiding the crowds, creating a personal camp atmosphere and delivering a great game experience. Alex Walkers Serian is $850 pppn and quite simply the best mobile operation in the Serengeti, but their frequent special offers put this product into the mid-range price category. These camps work very well with Plantation Lodge or Gibbs Farm in the Ngorongoro Highlands, both about $650 pppn which allow access to the Crater and Manyara whist avoiding the large hotels. At the higher end of the scale are operators such as &Beyond and Singita which start from $1,000 pppn upwards to $1,600 pppn. Then there are Serengeti Lamai and Sayari which are about $900 pppn. The higher-end product delivers a truly world class safari so if budget is not too much of an issue every penny is justified. With a few exceptions, no walking is allowed in the northern parks and game viewing is in closed-sided vehicles. However, it is now possible to take good - albeit short - safari walks in the Serengeti with Serian and Nomads from their mobile camps and from Sayari and Serengeti Lamai in the Lamai Wedge. If you would like to walk or hike properly, it is well worthwhile getting off the beaten track, out of the National Parks and into the less tightly-regulated concession areas. The best of these for walking are around Nduara Camp in the Loliondo region, or with the Hadzabe hunter/gatherers near Eyasi. Guided walks, often led by Maasai, are also rewarding along the top of the Great Rift Valley escarpment, overlooking Manyara. The starting point for a northern safari is Arusha, which was once a traditional Maasai village. International flights arrive either through Dar, a two hour flight from Arusha, or Kilimanjaro which is only a half an hour drive away. Your northern safari can start with a short flight from Arusha to any of the parks, or even a drive. While we try and make our website as comprehensive as possible, if you would like some more background information, have a read through the Cadogan Guide to Tanzania and Zanzibar - Northern Circuit Chapter, written by one of our director’s Annabel. The most recent edition was published in 2005 so some of it might be slightly dated but generally it’s as comprehensive as they come. We don't just know Tanzania! For more information on Tanzania, the best thing to do is to give us a ring for an impartial chat. Although we love Tanzania, we also love the rest of Africa too and have experts in all the main safari countries. If you are undecided as to where to visit, please do just drop us an email or give us a call! We have specialised in tailor-made Tanzania Holidays and Tanzania Safaris since 1998. Our knowledge and experience will guarantee you the very best possible itinerary for your budget and travel dates, and your money is protected by our ATOL bond. We have specialised in Tanzania since 1998. Each consultant knows Tanzania backwards, ask us anything!